This time we’ll look at two less frequently grown plants in the Apiaceae family of vegetables – parsnip and bulb fennel. I’ve grown parsnips and I’ve tried to grow bulb fennel, with no success. I’ve planted what was identified as bulb producing fennel a couple of times and I’ve never been able to grow a bulb; only tall and exuberant fronds with lots of flowers and seeds. That’s not to say it can’t be done. So why bother if I’m only getting the leafy plant? Because I like the fennel seeds that follow the flowering, a tasty treat that freshens your breath and aids indigestion. Chew them when they’re still a bit green for a lovely pop of flavor. Fennel seeds can also be used in cooking and as a flavoring. It tastes like anise. The feathery fronds are edible and can be added to salads. If you are lucky enough to get a root, chop it up and add raw to salads. It’s delightful. Letting this plant go to seed, however, is problematic. You’ll have a LOT of fennel seeds and next year you will a have a LOT of fennel everywhere. Fennel can create a veritable wall of delicious vegetation that is not easy to remove as it has a long taproot. Fennel has a few more benefits that might just make it worthwhile. It is highly repellent to fleas; you can put dried fennel leaves in a kennel to protect your dog. It also repels aphids. And it attracts some of the bugs you’d like to see in your garden – ladybugs, hoverflies, and parasitic wasps (the good ones). Because it has a taproot, it does not like to be transplanted. Sow it where you intend for it to grow. And sow it by itself; fennel has no plant companions. Fennel can withstand cold weather but harvest before freezing. Health Benefits of fennel: Fennel (the bulb) has a good amount of dietary fiber, as well as vitamin C, folate and potassium. Parsnip seeds deteriorate quickly so get new seeds every year. If you are trying to save seeds, you’ll need to let the plant overwinter and go to seed the following year. It’s a biennial. Mother Earth News suggests sprouting your seeds first in a wet paper towel in an airtight container, and then planting them once the first seeds have sprouted. They need 110 to 120 days so plant them in early spring in loose, fertile soil. They’ll do well with an application of compost and regular weeding. And keep them consistently moist. These are thirsty plants! Harvesting and Storing Parsnips: Harvest them AFTER the first frost. The cold weather makes them sweeter. In fact, parsnips contain more sugar than carrots, and are comparable to bananas! Don’t let them get too big or they can become woody. You can leave them in the ground and continue to harvest through the winter (a straw mulch over the row will make it easier to dig them out). Or avoid the risk of over-maturity by pulling them out in the fall, washing them, and taking off the tops. Now they’re ready to store in the fridge (not freezer) in a plastic bag. They’ll keep up to two months. Pests: Several insects find parsnips a tasty treat. Their leaves can be invaded by celery leaf miner larvae and the root can be damaged by carrot fly larvae. Parsnips are also vulnerable to a whole host of diseases – parsnip canker (choose a resistant variety), two kinds of root rot (in which case, remove them from your property and don’t plant parsnips in that spot for four years), powdery mildew, and numerous viruses. Health Benefits of Parsnips: With everything that could go wrong with parsnips, why bother? Because parsnips are a very healthy food. They have anti-cancer, anti-inflammatory and anti-fungal properties. They are a great source of soluble and insoluble fiber – the kind that can reduce blood cholesterol. It is high in vitamin C and many of the B vitamins, as well as K and E. And they contain lots of mineral. Most of the vitamins and minerals are found close to the skin so peel it finely or cook it whole. Cooking parsnips: While you could eat it raw, it’s usually baked, fried as chips, roasted with other root vegetables, or boiled and mashed like potatoes. You can cube it and add it to soups or stews, or you can remove the cubes and use the starchy cooking water to thicken broths. Don’t overcook it; which is easy to do because it contains so much sugar. You can even make wine with Parsnips! Parsnip stems and leaves contain a photosensitive chemical that causes skin redness, burning and blisters if the skin is exposed to sunlight after handling. This is a type of chemical burn, not an allergic reaction. That’s why you want to remove the leaves and stems right away. Parsnips are also one of those vegetables that people with a birch pollen allergy may react to, with itching, burning, and breathing difficulties. Cow parsnip is a native plant found in many counties in Minnesota. It’s in the same family as parsnip and Native peoples are reported to have eaten the young leaves and stalks, but unless you know what you’re doing, it’s best to leave this parsnip cousin alone. Wild parsnip contain toxic chemicals called furanocoumarins. Like regular parsnips, the juice from the leaves and stems are photo-toxic, causing a severe and persistent rash when the skin is exposed to sunlight. If you get any of the juice on your hands when pulling this plant out of your garden, wash your hands immediately. While researching this family, I learned about giant hogweed. This plant sounds like it came out of an X-File episode. Like parsnips, its sap has photo-toxic effects, but this plant takes it to the extreme. If you come in contact with it, the blistering can be so severe as to require hospitalization and it can leave lifelong scars and skin discoloration. If it comes in contact with your eyes, it can cause blindness. It is most common on the East Coast but has been moving steadily westward. It was recently found in Wisconsin… so it’s heading our way. The Apiaceae family of plants and herbs is also called the Parsley or Carrot family. It contains some of the most commonly used vegetables – carrots, celery, celeriac, fennel and parsnip – and many of our favorite aromatic herbs – chervil, parsley, cilantro, dill, cilantro, cumin, caraway, anise, lovage and angelica. It also includes some deadly relatives — poison hemlock and water hemlock – with the same flat white umbrella of flowers that has given this family its other Latin name (umbelliferae). Many beneficial garden insects love this type of flower. For example, if carrots are left to flower they will attract a beneficial predatory wasp. Another common trait found in this family is hollow stems. Children have been poisoned when they accidentally used hemlock stems for straws thinking they were a wild carrot plant. Best to plant these veggies and herbs yourself rather than forage, unless you really know your Apiaceae plants. Apiaceae plants have a few more tricks up their sleeve. Some contain a chemical in their sap that cause burn-like blisters and can change the pigmentation of skin exposed to it, which can happen during harvest on a sunny day. Some can cause mild to severe allergic reactions in people who have an allergy to birch trees or mugwort. Who knew these common veggies lived in such an unsavory family! This is such a large edible family so I’ll write about carrots and celery in this post, fennel and parsnip in the next post, and the herbs in a following post. A useful book to learn about companion planting. Carrots achieved literary fame with the book “Carrots Love Tomatoes” … and they do. Tomatoes can shade carrots, which are sensitive to heat, and the tomato plant secretes a chemical that repels insects that harm carrots. But if you plant the two too close, all that shade will stunt carrot growth. I interplanted my carrots with taller plants last summer and they didn’t do much until I harvested the other plants and gave the carrots full sun at the end of August. By the end of September they were nice and big. Radishes and carrots are ideal for planting together; harvest the radishes in 45 days and then let the carrots keep growing into the space left behind. Carrots are vulnerable to carrot root fly. Onions, leeks and chives repel carrot root flies. They also provide the carrot plant with dappled shade, so they make good companion plants. Don’t plant them by brother parsnip or you’ll attract a double dose of carrot flies. Carrots are also vulnerable to root knot nematodes. Marigolds repel nematodes, but I’ve read that they need to be grown in that area for a year before they’re going to be most effective at that job. We regularly grow marigolds to repel pests but I was unaware of the need to have planted in that space the prior year. Serving Carrots for Greatest Nutrition: Everyone knows the bright orange of carrots comes from its beta-carotene, but did you know that only 3% of that beta-carotene can be accessed during digestion when you eat carrots raw? (I should say, I’m not a food scientists; I learned this while researching carrots.) Beta-carotene is 10 times more accessible when the carrots are cooked or pureed. Carrot greens are also edible when harvested young. They can be used in a stir fry or salad. Storing Carrots: Carrots are long-lasting veggies, capable of being stored for months in the refrigerator or throughout the winter if placed – unwashed – in a bucket of sand and wood shavings or in soil between 32 to 40 °F. You can also keep harvesting them right out of the ground! Some people have an allergic reaction to carrots. If, like me, you’re allergic to birch tree pollen or mugwort, your immune system can become confused by a protein in carrot that is very similar to the tree pollen, which is the cause of the reaction. Cooking it does not help. This is a powerhouse plant. The stalk is eaten as a vegetable; the leaves as a seasoning, and the seeds as a spice (but don’t eat seeds you buy for planting; they are often treated with a fungicide). Add salt to celery seed and you’ve made celery salt, a common Cajun and Creole seasoning. Chop the stalks up and add in carrots and onion and you’ve got the holy trinity of French cooking, mirepoix. Because celery requires a long growing season, it’s not typically grown in a home garden in Minnesota. Maybe we’ll be able to grow celery as we get further into climate change … but you might not want to. It requires a lot of special care, such as planting in deep trenches to prevent light from reaching the stem. Health Benefits of Celery: Some research says celery seeds and celery juice reduce high blood pressure. Storing Celery: Celery looks fragile but that’s deceiving. It can be stored up to 7 weeks at temps between 32 to 36 °F. Even if I could, I won’t be growing celery anytime soon. It is one of the most allergenic vegetables. For some people, eating celery can result in fatal anaphylactic shock. The allergen is not deactivated by cooking. Celeriac (or celery root) is more reactive than the stalk, and the seeds more still. Since celery seeds are used in a variety of products, this can be quite a problem. Celery juice and celery juice powder is a common natural preservative because it is high in nitrates. Because it’s a plant-based nitrate, I’ve read that food producers can use it and still label their product “nitrate free” or “no added nitrates.” If you are sensitive to nitrates and get migraines, you may need to take care when eating celery and other high-nitrate vegetables — beets, lettuce, radishes and spinach. Where is change happening in your yard – and in your life? The sun has been a primary change agent. When an old apple tree was struck by lightening and came down, we gained a sunny back yard and a much larger vegetable garden. When an ash tree came down, we gained a side yard vegetable garden, solar electric and solar hot air. When the city-owned boulevard trees grew too tall, we lost half of our side yard garden and we lost the ability to plant late season crops. People are a major change agent. Because I live on a corner lot, my space is vulnerable to theft and I’ve certainly experienced a lot of it. As a poor single mom, it was devastating when my children’s bikes were stolen and the first gift from my husband — a concrete lion for my front stairs – was taken in the middle of the day. We didn’t have the money to replace them, at least not for a long time. It makes one want to give up. Or get angry – I’m more of an anger person than a giving up person. I continued to invest in the things that would bring us happiness – like a hammock, which I chained to a tree. I invested more in things that went into the ground rather than on top of it, thinking it would not be as attractive to thieves. That’s only partly true. In 2014, someone stole my boulevard plants the day after I put them in the ground. In 2013, someone stole my entire pepper harvest. That was the worst betrayal. 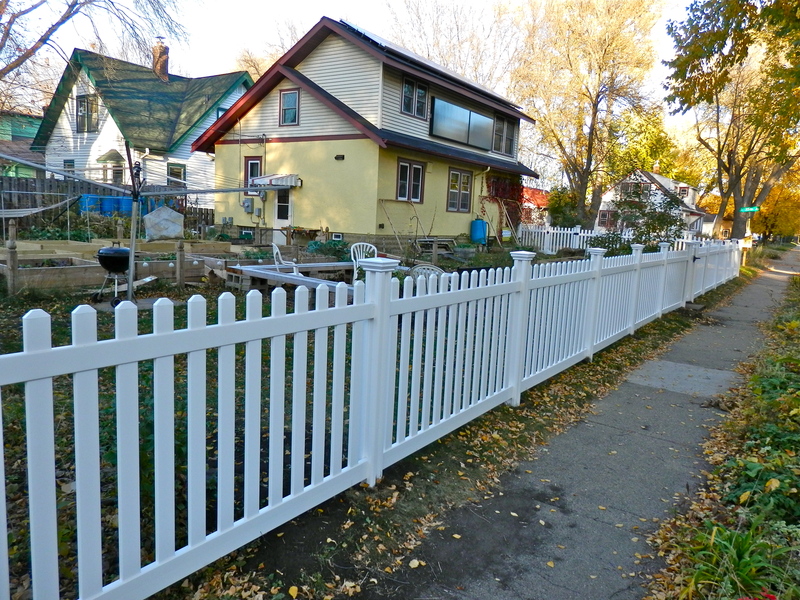 We hope the right kind of fence will create better boundaries without closing off the opportunity to socialize with our community. We decided to install a fence. Several neighbors came by to say they were unhappy to see us putting up a fence. They loved to see the garden. I feel the same way, but when I explained why and that it would not be a privacy fence, they understood. We’ll see if we’ve found the right balance. Children are major change agents: When they hit their mid teens, our kids had nothing more to say to us so we built a patio and firepit. Every evening my husband would sit by the firepit smoking a pipe (which he no longer does) and the kids would come out to chat. Usually there was no fire. But on weekends their friends would come over and we’d have a fire and maybe do some cooking outdoors or hang out until midnight. This was the most important space and the most important time – words could be spoken. City regulations are major change agents: Sitting around a fire late into the evening is no longer possible. The city changed its rules about fires in response to air quality concerns. I feel that as a loss, although not such a big loss now that the kids are grown and gone. Sitting around a fire in the evening is a special experience of bonding and social connection and I haven’t found a way yet to creatively respond to that loss. So here we are at the end of the year and this blog post is ending on a far different note than I expected when I started it. On the face of it, permaculture principle 12 sounds all hopeful and positive, but change often comes from difficult situations and is accompanied by feelings of anger and sadness and loss. How do we deal with that? I think we go back to permaculture principle 1: We stop. We observe. We interact with the new space and the new reality. Then we take an action – and we wait to see what happens next. Where are the edges in your yard? The edge of the house and the yard? That space has its own microclimate. It is typically protected from wind but may not get enough water. The edge of the yard and the sidewalk? This space has lots of visitors. Plants may need to survive dog urine showers and sidewalk salt. The edge of a yard and a driveway? Snow will be piling up here – up and up. Delicate shrubs may not like getting hit with snow from the plow. The boulevard between the sidewalk and the street? Another microclimate, more challenging soil conditions, more public traffic. The open yard and the side of a fence? Think about shade, protection and structure. 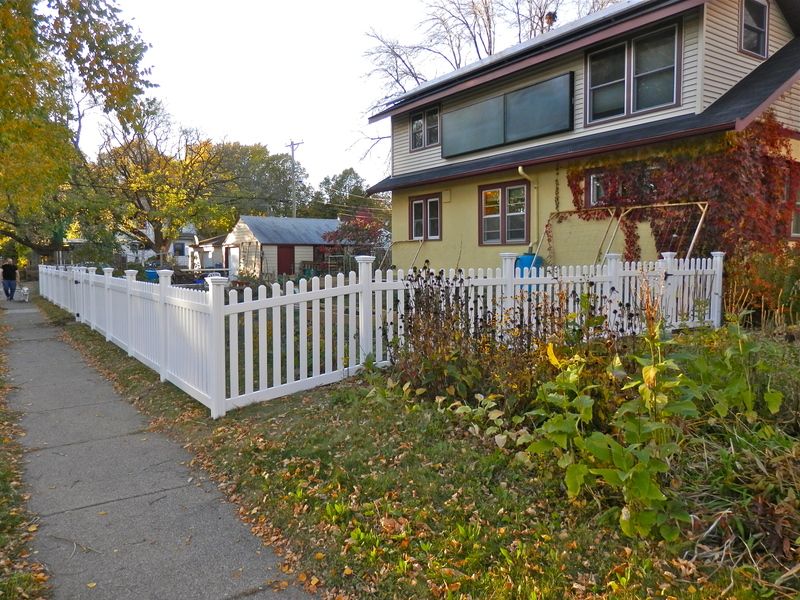 In 2014, we added a side yard fence. Now I can begin adding a shade flower garden within the border of a fence. Edges can be hard places to work with, but they present a lot of interesting opportunity and natural diversity. “Weeds” tend to appear in those places where it’s harder to survive. Is it truly a problem plant? Is it a plant misplaced? Or is it a plant you don’t yet know? We’ve spent a bit of time in the last two years learning about wild edibles. We attended a foraging class with Charley Underwood through Exco, experimental community education of the Twin Cities. Not only did we learn to identify some of these plants, we got a chance to eat them. Ilze Mueller has conducted “weed walks” through her community garden with folks from Transition Longfellow. Friend Elizabeth Blair told us about the Minnesota Mycological Society, which sponsors mushroom walks. Whenever a new mushroom pops up in our yard, she comes over to identify it for us. When I posted a question about whether my chokecherry tree was the right kind to harvest from – chokecherry or chokeberry, but only one is “edible” – a naturalist who is a member on the Transition Facebook page came to my yard and showed me around it in a whole new way! Before we judge a being that lives along the edges too harshly, we should try to understand who and what they are and the benefits they bring. Efforts are underway in our city to develop more seed saving capacity by training more seed savers. I believe another goal is to grow out seed in our local area so it can acclimatize to changing local conditions. I was trained in how to segregate tomato plants, document their growth, and save their seeds. I was given 16 plants and I spent the summer worrying about my new babies – the Hugh tomato. Suppose they didn’t grow? Would this plant be lost for all time? Diversity is like an insurance policy buffering us against disaster, disease and failure. You never know when we may need the unique qualities of this or that version of a plant. 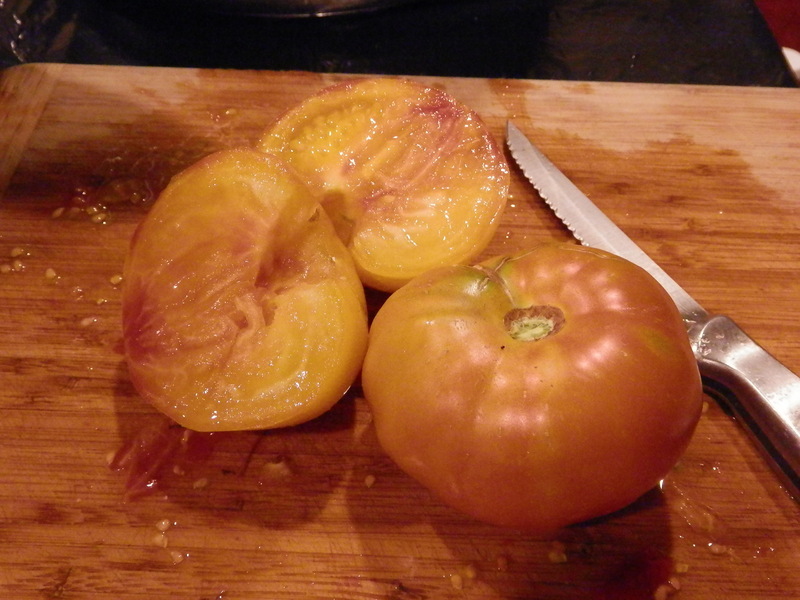 For example, this year I grew four types of tomatoes. Two of them became mushy and split due to inconsistent watering (excess rain and my fault). Two of them did just fine, so I still had tomatoes to eat but not enough to can. I am absolutely fascinated by the story of seeds. Each generation of a plant carries forward everything its parents learned about living on the earth – how to deal with wind and water, lots or little nutrients, lots or little sun, an ever increasing amount of carbon. That plant ALSO learns and its seeds carry that knowledge into the next generation. It adapts – sometime better and sometimes worse. I’m sure it’s obvious but be sure to plan for early, mid and late season crops so you’ve got something to eat all the time. Transition Longfellow hosts a winter seed sowing workshop every year. 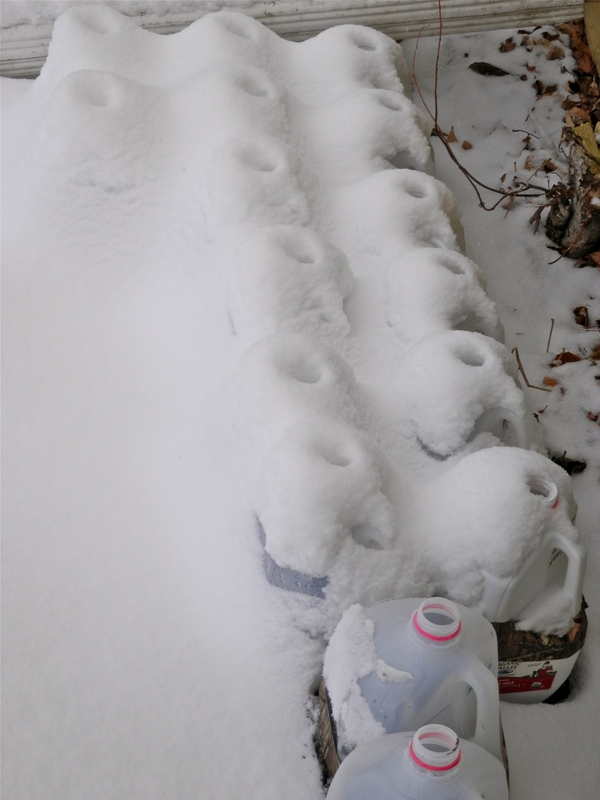 We plant early spring crops – spinach, lettuce – in milk cartons and leave them out in the snow. As the weather warms, they grow when they’re ready. By springtime I’ve got 50 little lettuces ready to put in the ground. And then I inevitably make the mistake of actually putting 50 lettuces in the ground because I’m enthusiastic. It’s a mistake because I can’t use that many at once. I need 10 lettuces in week one … and 10 in week two … and 10 in week three. I need to put in kale and collards, too, not just lettuce. This ensures I’ve got something all summer long and into frost season, and that my garden isn’t overgrown. I will admit that I don’t worry too much if I find that some of my plants have gone to seed. I harvest lettuce seeds. I’ve had kale and collards regrow from where I left them in the ground the year before. It’s free food. Another part of diversity in my garden is planting flowers along with the vegetables. 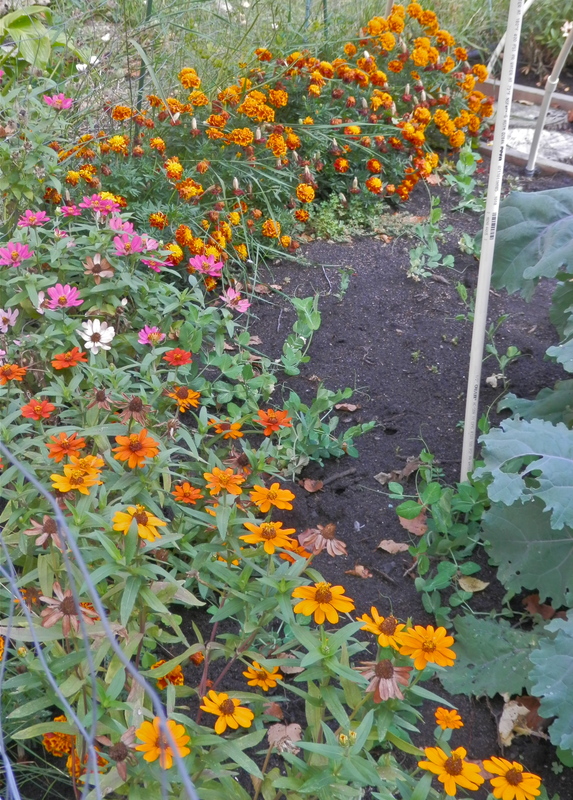 I always have one garden with a marigold border for my husband. My new favorite is borage flowers and I must admit I let them go a bit wild because I love to eat the flowers. We have lots of happy pollinators. Permaculture values the wild places. They need to be protected. Earlier I wrote about zones. A permaculture design usually includes a ‘zone 5’ area which is left for nature to do as it will. I’ve got spaces in my yard I don’t touch – and spaces I touch only once a year. When I see a “weed,” I wonder about its potential. Will it put out a pretty flower later if I leave it now? I’ll love it for its qualities – it’s airy and light, it’s pleasantly lobed, it’s functional, it has lovely purple flowers (yeah, you know the one I’m talking about). I’ve often been rewarded by beautiful wild flowers for my efforts – such as the lovely flower of the yellow goat’s beard. Because my love is in the details, I sometimes overlook the fact that too many of these unexpected visitors will make my garden look unkempt. That’s why it’s good to have an area you can leave to its own devices and love for its many surprises. Small and slow solutions will be increasingly important in an energy-constrained future. Large, fast solutions typically use more energy and are more expensive. It may be appropriate to use a lot of energy to set up a system, but in the long run the system should be self-sustaining. 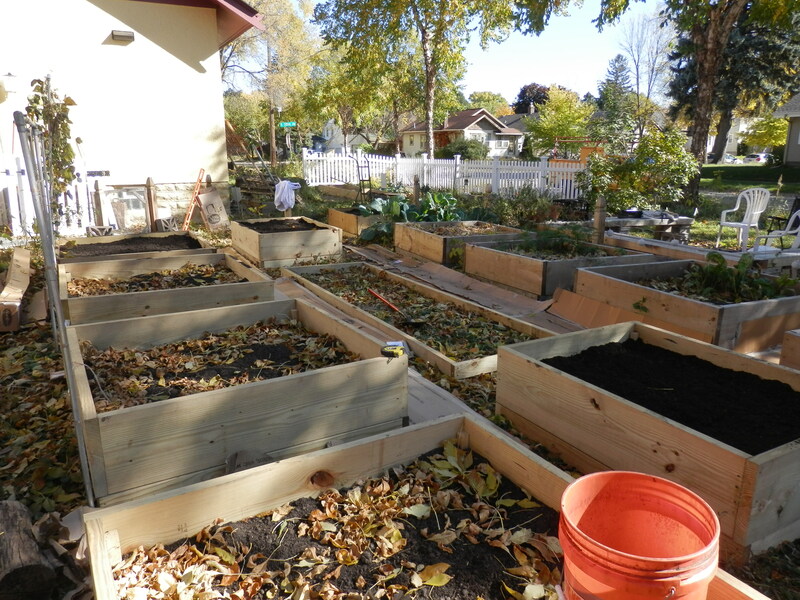 I think an example of a slow solution – maybe the only example I can think of, since I’m bad at doing things slowly – is our raised garden beds. We now have 18 raised beds but we didn’t start there. We started with four. They worked well and helped us achieve the goal we were seeking: making it easier for me to keep the garden weeded even when my back was acting up. I quite enjoyed weeding them. I could sit on the edge and reach everything. It takes about 15 minutes to weed one bed. I can easily do three or four in a day. The next year I added five more. It continued to work well, so in the fall of 2014 we went all out and added nine more. Now we’re done. I hope this investment proves to be, as Bill Mollison would say, appropriately scaled. We’ll know if I can maintain them without feeling overwhelmed. If I were to do anything differently, it would be that I would not have added more beds until I had figured out the best way to keep them watered. But that’s not a new problem. I’m always struggling with my water setup. Perennial plants are the epitome of slow and small solutions. In my garden, rhubarb and raspberry took a bit of time to get established but once they are contented, I do nothing for them but harvest! I want MORE of these kinds of crops – more sorrel, more asparagus, more horseradish, more dill (evidently I’m not going to have any trouble getting more of those last two). I’m hoping that next year I’ll find that the ground cherries have reseeded themselves. Soaking and fermenting food takes a few days or weeks before it’s ready to eat but the food then requires no cooking – not fossil fuel inputs for cooking or for storing! Biking takes more time but is so much more enjoyable than driving. I check out gardens. I can say hi to neighbors. I can observe more of what is going on around me. Because I was biking, I have stopped at small shops in our neighborhood that have become new favorites. Slow and small has some very big advantages. One of the things I’ve been thinking about is whether I am using something for its “highest use ” or “highest purpose” – something like electricity or space or whatever. If what I’m doing is not its highest use (general lighting rather than task lighting, for example) could I avoid using it if there is a negative cost to it (walk through a dimly lit room)? Is there something else I could do? I recently became aware of the fact that desktop computers use a lot more power than laptops (supposedly), which use more power than tablets and phones. When I turn on my very old desktop computer for some small task, or just to stay connected to Facebook, how much electricity am I actually using? I decided to look it up.